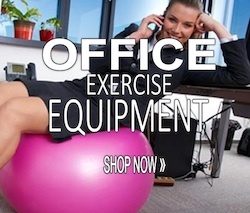 Another unusual piece of exercise equipment for the office is the Hand Fitness Trainer. Put this on and wave to your coworker, smile and talk like R2 D2 and they will wonder what happened to you. The Hand Fitness Trainer is said to reduce the symptoms associated with maladies such as arthritis, carpal tunnel, tennis elbow and tendinitis so, put your hands together for – the Hand Fitness Trainer. Worn like a glove you can exercise your fingers and adjust the resistance to your needs. The elastic bands strapped to each fingertip, providing resistance as you open your hand and by opening your hand you will strengthen the extensor muscles in your hands, wrists, and elbows. 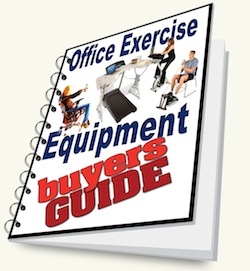 If your job or hobby requires manual dexterity this could be the innovation for you. Although it is new on the market The Hand Fitness Trainer has already won a Medical Design Excellence Award. Thanks for the information. I wonder if there are other hand exercises a person can do for strength building? Hi Harry – there are some great hand strengthening videos I saw on YouTube. Finger stretching as well. can you give me a link where can i buy this. 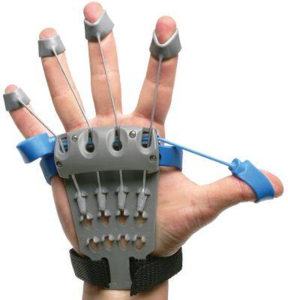 Hi Deepak – yes – here is a link to the hand trainer.